The purpose of this page is to document all of the known tricks of NDS New Super Mario Bros so far. Because of the nature of this site, we concentrate here on tricks that are extremely difficult to execute in real play, but are useful in the making of tool-assisted speedruns. For most of the tricks, a frame advance feature in an emulator is a definite must-have. TODO: Make clips of these segments and cut the useless screen out. DS New Super Mario Bros. (USA) "warps" in 21:08.08 by adelikat, terrotim, mindnomad & Y05H1. This run beats the previous run by 33.46 due to a new method of going through World 8-Tower 2 as well as various in-stage improvements. Note: the RNG is actually a single 4-byte address but it is easier to monitor it as two separate addresses. The starting RNG depends on the date and time you start the movie. 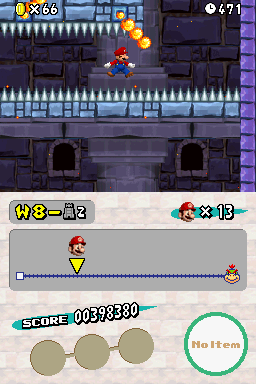 The RNG changes whenever certain sound effects are played, whether by Mario or the background music itself (though this depends on the level). Luck can always be manipulated by either double jumping, throwing something, wall jumping, and very frequently - (though not always) by breaking a block. When the final cutscene in World 8-Castle 2 (Bowser Jr. throwing Dry Bowser into the pot) activates.